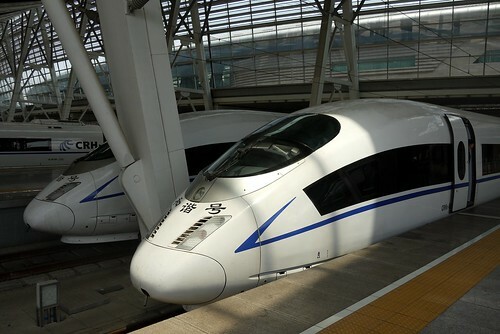 From Shanghai, an overnight train took us to Beijing. Robin and I spent a week there, taking a much-needed break from moving around every day or two. I also had quite a bit to prepare for my upcoming bike and train trips, especially buying a bike and getting some riding in! We went for Peking Duck on our first night, then since the restaurant was expensive we visited a nearby "night market" for desert. This was the most orderly night market I’ve ever seen. Usually they’re a chaotic jumble of carts, stalls, and tables, and they run from sometime in the evening until late at night. This one had a single type of stall and about 6 different types of food repeated over 30 or so stalls. The big surprise was that it shut down precisely at 10 PM. They turned off the power, people started packing up, and other people started washing the sidewalk in front of the stalls. This wasn’t just a hose job either – they were dumping buckets of soapy water and scrubbing too! One morning, we rode out to the 2008 olympic park. The bird’s nest now houses some cheesy tourist attractions we figured weren’t worth $7 to see, so we stayed outside. The acquatics centre is closed for renovations! This was also the day of my best ride. Heading straight north from the olympic park, I first rode on new roads built for the olympics then on a highway with nice wide shoulders and hardly any traffic. As a day trip from Beijing, I headed to Tianjin on my own, partially to take the Hexie and partially to escape Beijing’s pollution for a day. Tianjin reminds me a bit of Kunming in that it’s a modern, clean Chinese city with nothing remarkable but just enough to see to make a good day. Robin and I also headed to the Lama Temple (for a taste of things to come in Tibet). The unusual thing about this temple is my ticket contained a business card-sized CD. I don’t know what’s on it but I’m bringing it home to check it out. I visited the Temple of Heaven on my own since I happened to ride by it. This is a 1000 year old temple complex. The best part are the grounds around the temples, which are beautiful juniper orchards largely free of tourists. All in all, I really liked Beijing and I’m looking forward to going back for a day on my way out to Mongolia. The people are more civilised than in Shanghai ("raised by wolves" is the exception rather than the rule), and there are lots of little alleys (hutong) that are great to wander through. We stayed at a hostel located on a very hipsterish hutong, Nanluogu Xiang. It and the streets nearby are full of trendy shops.. there’s even a Holga Camera shop! Photos from Beijing are here. The inside of the trains is a close copy of the N700 Shinkansen. From the outside, the train is sleek but looks less aerodynamic than the N700, which has rubber seals at the couplings rather than a big gap like most other trains. So I have no idea how it manages to be so fast. Better motors? More modern track design? 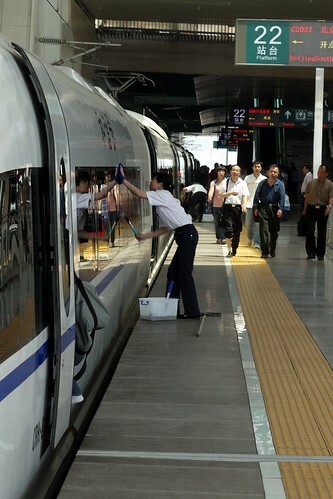 They’re proud of these trains though.. at the Beijing end, an army of workers handwashes each car with a squeegee before every run! China 2: Leap That Gorge! Tiger Leaping Gorge Day 1: an early start to the day.. we left Mama Naxi’s Guesthouse in Lijiang at 7:30 in a minivan shared with 5 other hikers after one of Mama’s huge breakfast sandwiches. We arrived at Jane’s Guesthouse in Qiaotou just after 10, ready to start our hike. Unfortunately, Robin slipped on some concrete steps at Jane’s and hurt her shoulder… but she was willing to try hiking so we set off. The beginning of the hike wasn’t that interesting. We were walking on the "high road" through the back ways of Qiaotou town, passing by a couple of schools and then a field of ponies for rent. A couple of the pony renters followed us in case one of us wanted a ride. This actually worked out well because Robin was having trouble carrying her bag because of her injury, so she paid a pony guy to carry the bag to the top of the 24 bends path, the highest point of the hike. Once we left Qiaotou, things got more interesting and more scenic. We made plans to meet for lunch and I left the group, wanting to hike as quickly as possible (for the fun of it… I enjoy expending energy on silly pursuits.) I arrived at Tea Horse Guesthouse, ate lunch, and read my book while waiting for the others. After lunch it was easier going. We had already covered 2/3 of the day’s distance and most of the climbing. Robin decided she was able to carry her own bag now, so we did the hike to Halfway Guesthouse together and arrived before any of the others. TLG Day 2: we got going fairly early again. I stayed more or less with Robin until the turnoff to the big waterfall, an optional side trip that only I wanted to do. After that hike (another fun climb,) I ate lunch at Tina’s Guesthouse then did the walk down to the river to see Tiger Leaping Stone. This is what gave the gorge its name – according to legend, a tiger once leaped the whole gorge from this stone to the other side! 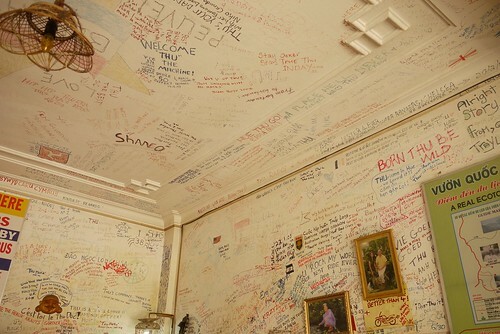 After that, I climbed back up the same way and met up with Robin at Tina’s. We organized a group of 5 heading back to Lijiang and set off in a minivan. The drive back was via the "low road", which was under intense construction to widen it and allow bus tours to visit the gorge. This made for a very bumpy ride and an interesting stop. There was a section of the road that was being widened, and this was being done by a group of about 10 men at the top of a scree slope digging out and throwing down boulders. Most of them bounced down the scree slope, across the road, and down into the gorge, but some stayed on the road. We all watched from a safe distance for about 20 minutes, then our driver blew a whistle to get the workers to stop. They did, and the drivers of all the waiting vehicles all rushed into action picking up all the boulders left on the road and throwing them over the side of the gorge. Then into the minivan and off we went! We had to change minivans at Jane’s guesthouse. Our driver paid another driver to take us from Jane’s to Lijiang. This woman was quite the piece of work. She wouldn’t let any of us sit in the front, and then she stopped in Qiaotou town to pick up 2 more passengers… or tried anyway. A couple of the people we were with spoke fluent Mandarin, and argued with her that no, she couldn’t do this. We had paid for the whole van at a much higher rate than the "per seat" price, so there was no way we were letting on two more people unless they paid us. Surprisingly, we got our way. Then in Lijiang, more driver drama.. the woman claimed not to know how to get to the old town and wanted us to take a taxi (at our expense.) OK, so your job is driving tourists back and forth from Lijiang, and you don’t know how to get to the most touristy part of town? Clearly she just didn’t want to do the work. Luckily, our Mandarin-speaking friends saved the day again and gave her directions! We arrived back at Mama Naxi’s Guesthouse in time for dinner. I’ve mentioned this before, but the dinner was amazing. Buffet style traditional Naxi food, more than any of us could eat even after a day of hiking, for the equivalent of $2.50! What a great way to end the day! TLG photos are here – Gorgeorific! 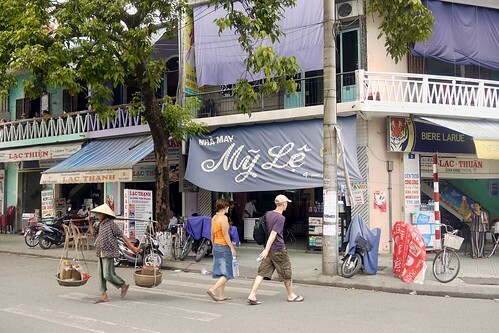 We left Hanoi on a complicated trip to Cat Ba Town: bus, bus, boat, bus. Fortunately, this was all supplied on one ticket from one company, and wasn’t any more expensive than arranging it ourselves. Cat Ba Town is on one end of Cat Ba Island in Ha Long Bay. It’s mostly a destination for Vietnamese tourists but is also home to Slo Pony Adventures, which runs rock climbing all around the bay. All the climbing on Cat Ba Island itself is in the beautiful Butterfly Valley, a 15 minute motorcycle ride from Cat Ba Town. It’s a great crag – no multipitch but with several climbs in the 25m – 30m range. Lots of variety in the grades. Robin and I climbed there for a couple of days then took a rest day. I went out to the crag on our rest day anyway, but not to climb.. I did it for the goat and the ride. The ride was a great bike ride to Butterfly Valley on an actual mountain bike (nice to have something with gears and decent seat height after the pokey Asian singlespeeds I’d been riding.) The goat was a goat! There is a family of farmers who live and work at the base of the crag, and they organize an amazing lunch for hungry climbers. But goat day was special: a whole bunch of climbers pitched in and they spit roasted a whole goat over a wood fire! Nom! We also spent a day out on the boat.. Slo Pony lease a boat that’s used for Deep Water Soloing trips and taking climbers out to crags on other islands. They also organize tours on days when nobody’s using the boat for climbing, so Robin and I did one of those. We kayaked, visited a fish farm, and enjoyed fresh clams cooked in the boat’s kitchen. Ha Long Bay is a great spot for climbing.. one of the ones I definitely want to return to (along with Tonsai.) It’s not as popular a destination as Tonsai but it’s easy enough to find partners. There’s lots to climb in Butterfly Valley and there are loads of other crags on other islands we didn’t have the chance to explore. Cat Ba photos are here. Ha Long Bay photos are here. From Cat Ba we took the same boat + bus trip back to Hanoi (I wanted to take the train from Hai Phong but the boats to Hai Phong were sold out and it would have been more complicated and expensive anyway.) From Hanoi, we took an overnight train to Lao Cai and a shared (leaves when full) minivan up the mountain to Sapa. Sapa is another beautiful place, and also a bit strange. The strange part is the hundreds of women from nearby minority villages that come up to Sapa to sell their crafts (bags, hats, clothing) to tourists, both foreign and Vietnamese (we visited during the May 1 holiday weekend, so there were a LOT of Vietnamese tourists!) It can be fun to engage them in conversation for a bit.. I eventually figured out that just because they want to sell you something doesn’t mean you can’t talk to them about other things :) But eventually they move on if you’re not buying. We then headed even furthur along the same road to Sin Chai.. much less touristy, mostly occupied by farmers (although one woman tried to get us to come into her house and smoke opium!) I was also trying to find one of the approaches to Mount Fansipan, the highest peak in Indochina, but gave up. Just as well – Mr. Fancypants had his head in the clouds for our whole visit! The next day, I wandered up Ham Rong mountain, which is is a well developed park in Sapa itself offering great views of the town. Then I rented a bike and rode to another village, Ta Phin. I visited one of the local houses (on the invitation of one of the ladies making crafts in the town square) and after 5 minutes of polite conversation, was set upon to buy things (of course.) I also visited Ta Phin cave, which was free but some guys at the entrance wanted money to turn the lights on. Great – caves are much more fun to explore with a flashlight anyway! From Ta Phin I rode back up to Sapa then over to Silver Falls. I didn’t actually go to see the falls themselves because it was getting late and I wanted to be back in Sapa by dark… but the ride was great and so were the views along the way! Sapa photos are here. There are also a few photos from my passport retrieval misadventure. Or you can look at all my Vietnam photos here – they’re all uploaded, finally. Toyota pretty well owns the market for saloon cars (almost always Camry) and pickup trucks. Hyundai is the brand of choice for minivans. Honda is doing well too: they have a huge share of the small (100-125cc) motorcycle market, which is a popular way to get around in most places, and the dominant vehicle choice in Vietnam. I’ve seen signs at parking lots giving prices for "Hon Da" instead of the correct word, which is "Xe Mai." In some cities, the Internet Explorer logo is used on signs to mean "Internet Café." I thought the Internet Explorer logo just meant viruses and incompatibility. I’m very glad to be travelling with my own laptop. I often see signs advertising that a restaurant or tourist attraction has been recommended by Lonely Planet or Rough Guide. Are they really the final arbitrers of quality in the world? The one on the left was actually recommended by Lonely Planet and Rough Guide. The other two are squatting on its reputation and lying about the recommendations. The first bicycle I ever bought was a Giant Sedona ATX back in 1994. It was a rigid frame mountain bike with STX (slightly above today’s Alivio) components. I rode it all over the trails of St. John’s, took it to university in Kingston, put it on a train to Vancouver, then rode it back to St. John’s. In its 16 year lifetime it’s been repainted twice and rebuilt more times than I can count.. probably quicker to count the original components: frame, stem, cranks, chainrings. It’s now a cargo bike (Xtracycle) and is sitting in a storage locker in Montréal patiently awaiting my return. Bicycles 2 – 7 are, in order: a full suspension mountain bike (also a Giant), a fixie, a winter bike, a chopper, a folding bike (Strada), and a road bike. Bicycle 8 is a "Land Slider" cheap singlespeed that I bought in Tokyo. I parked it outside my former apartment building and I have independent confirmation that it’s still there. Now onto bicycle 9: a Giant ATX 770. I bought it last week in Beijing. Alivio components, RST Omega fork… I’m not too pleased with the fork but hopefully it will hold up for 3 weeks of abuse in the Himalayas. I’ve been riding it around Beijing. When I have the energy, it’s the fastest thing on 2 wheels, outpacing the electric and 2-stroke scooters many of the locals ride. When I don’t, it’s still pretty quick… definitely the best bike I’ve ridden in months! Hopefully riding in Beijing is good training for the low-oxygen air in Tibet. I’m sure I’ll be fine provided I can cough out whatever’s sitting in my lungs before I start the bike tour on June 1. We’re now on a train from Beijing to Xining. We left the hostel at about the same time but by different routes: she took the bus and I rode my bike. Before entering the station, I pulled out my multitool and took the bike apart to pack it in 2 large canvas bags (frame, fork, and bars in one, wheels and seat in the other.) From then on, it was a bit awkward to carry but I didn’t raise any eyebrows.. there were a few people with even bigger burdens boarding the same train. It’s now under my seat, and when we get to Xining I’ll put it together for another bit of riding. Robin and I are spending one night there before parting ways for a bit. She couldn’t find an affordable way to visit Tibet (and my bike tour is anything but) so I’m getting on a train to Lhasa and she’s getting on a train to Xian. We’ll meet up in Beijing in just under a month after our separate adventures!